Great hunting/companion dog, kid friendly, 9 week old puppy. Shots up to date (6 and 9 weeks). Looking for a family that has time to spend and train him. Not ideal for apartment or city homes. Please contact for more information. Adoption Fee Required. Overview: The Treeing Walker Coonhound was developed in Virginia. The breed is used by hunters to chase prey into a tree. They are good for hunting and as a companion dog. Coat: The coat is smooth and fine. Temperament: The Treeing Coonhound gets along well with children and other dogs. Care: The coat should be brushed occasionally. The ears need to be cleaned regularly. Bathe as needed. Training: The Treeing Coonhound is clever and trains quickly. Activity: This breed needs to exercise in a fenced area, or he may run off and get lost. They will run into the street and should be walked on a leash. Posted Breed: Treeing Walker Coonhound (short coat). Posted Breed: Treeing Walker Coonhound. 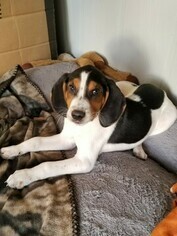 Posted Breed: Treeing Walker Coonhound (medium coat). Posted Breed: Treeing Walker Coonhound (short coat). Adoption Fee: 225.00. Posted Breed: Treeing Walker Coonhound / Yellow Labrador Retriever (short coat).